The CubeStormer can solve the Rubik’s cube in less than 12 seconds every time. And it looks like it could it be a StarGate. Prepare yourselves, humans! Be warned my fellow humans, robots will not be satisfied until they defeat us in even the most trivial of contests. 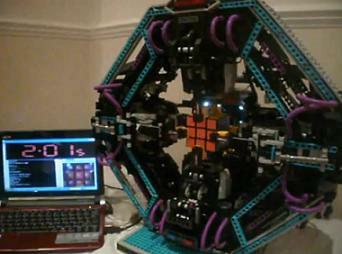 Cube Stormer is the latest creation from Mike Dobson, aka Robotics Solutions, and not only is it made entirely out of Legos, it can solve any 3x3x3 rubik’s cube in less than twelve seconds. Often it can finish in less than five! This thing looks badass and is incredible to watch. Check it out in the video below. We’ve seen some impressive robots from the Lego Mindstorms community before, most notably the fully functional model of an ABB Flexpicker. Little did I know, however, that these Lego bots were out to solve the Rubik’s cube. Cube Stormer is just the latest and fastest of these robots, there are many others. Something else I didn’t know: 12 seconds isn’t even a world record for cube solving. The fastest human solved a randomized cube in around 7 seconds. Don’t believe me? We’ve got that video, too! Still, if 12 seconds isn’t a world record, 2 seconds is. That’s the fastest we see a Cube Stormer solution in the video. The fastest human average time for five solves is around 10 seconds. I’m guessing that the Lego robot could defeat this time by a significant margin. What does this teach us? Robots are better than humans even when it comes to colossal wastes of time. Oh, and robots are becoming more advanced everyday, even amateur robotics are impressive now, yadda yadda yadda Singularity, Kurzweil, future! Sorry. My mind needs a distraction after the psychological trauma that is watching one childhood toy (Legos) defeat another toy (Rubik’s cube) in a pitched battle. Maybe I’ll go work on a Sudoku. Lego robots haven’t attempted that yet, have they?